Enable or Disable Sale tag for Discounted Products. 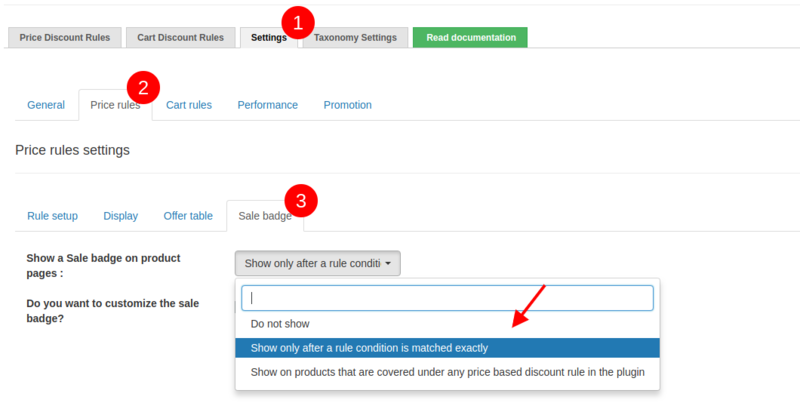 Let us See what is a Sale tag and how to enable it with our Discount Rules Plugin. What is a Sale Tag ? As you can see, the Sale price is lower than the Regular price. So WooCommerce treats this product as on SALE!. It shows a SALE badge on top of the product image. By default, WooCommerce only shows a TEXT.... i.e., SALE! Please go WooCommerce -> Woo Discount Rules -> Settings -> Price rules --> Sale badge tab. Select your desired option and click on Save. The sale badge will be enabled only when the condition matches. You have created a discount rule for Buy 5 or more cap, get 10% off. Now, the sale badge will be displayed only when the cart contains 4+ quantities. The sale badge will be displayed irrespective of the condition being matched or not. Now, the sale badge will be displayed rightaway even if there are no products in cart. Since Woo Discount Rules version 1.7.7, you have the option to customize the "text" on the SALE! Badge. or even add a HTML snippet for more advanced customizsation. IMPORTANT! : Change/customize the HTML elements only you know what you are doing. My storefront used to have the discount shown on the Sale badge. Why I could not do that now? The Sale Badge is usually a static text. WooCommerce by default only displays a static text: Sale! However, some theme authors customize this text within their themes to show a discount percentage or amount. However, when using a dynamic pricing plugin like Woo Discount Rules, the discount is based on the rules. Buy 5 or more products, get 5% off. In this case, the 5% discount is eligible ONLY when a customer adds 5 quantities to cart. But if we show a Sale Badge with 5% discount on it, customer will MISUNDERSTAND and will look forward to get 5% discount even when he purchases 1 quantity. But that is not the condition. That is the reason why we do not display a discount percentage or amount inside the Sale badge. Our plugin will just show the default Sale badge text (Sale!). To enable the Strike out discount and the Discount table . Feel free to leave your question and email by clicking the Live Chat button below or you can submit a support request.